Meg Foxe has stumbled upon a book so powerful that it changes her life. Its words comfort and soothe her troubled mind like nothing else. But there’s a problem. The book is banned throughout England. And Pernell, her husband, the man she loves more than anything else in the world, has devoted himself to its total annihilation. Meg can’t bring herself to give up the book—but how long she can keep her secret hidden from Pernell? Swept up in the turbulent world of sixteenth-century England and King Henry VIII, where William Tyndale’s English New Testament translation has been outlawed as heresy, Meg is about to align herself with those who risk their lives to read and distribute God’s Word. A thrilling espionage game of cat and mouse . . . a shocking discovery that threatens to shatter both a career and a marriage . . . a front row seat in the court of Henry VIII, where politics and religion mean life and death . . . 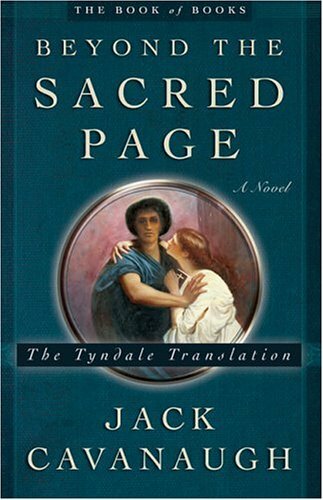 Beyond the Sacred Page is an electrifying read—historical fiction at its best. Meg is a great heroine: strong, caring, compassionate, and brave (though not without her vulnerabilities and personal demons) and seeing her grow – mostly in a spiritual way – throughout the book as she discovers the wonders of the Bible is beautiful. Her character changes were portrayed incredibly well and I really appreciate the skill Jack Cavanaugh has with writing from a woman’s point-of-view. Well done. Pernell is a bit more difficult to like, seeing as he’s dedicated his life to hunting William Tyndale and eradicating the English translation of the Bible from British soil, but his deep love and concern for Meg and his high principles (misguided though they may be) have you (or, at least me) eventually warming to his character. Particularly when you see him beside some of the other guys who are also ‘heretic-hunters’ but total creeps. Oh, and there’s also Nicholas, the baker, who’s probably my favorite character in the whole book. He’s awesome, but I can’t say much about him without giving away plot points and other semi-spoilery things. So I’ll just leave it at that and discuss the other main(ish) minor character in Beyond the Sacred Page: Anne Boleyn. I know, I know. The whole thing with “the book’s main character meets every important historical figure of their era” is rather over-done (and Jack Cavanaugh does it quite regularly himself) but Meg’s encounter (and subsequent friendship – of sorts) with the queen was quite believable, considering the circumstances in which it came about. (Meg was summoned to court to entertain the queen with her expert playing of the virginals – a sort of harpsichord – and the queen liked her playing so much that she kept Meg around.) I think the portrayal of Queen Anne was done in a respectful way – Jack Cavanaugh obviously believes that she became a Christian, something that, after having read other accounts of Anne Boleyn, I have no problem with. What else is there to say? Cavanaugh’s attention to historical detail and accuracy is, as always, astounding and his writing style much improved from Glimpses of Truth (though I may still like that one better – the characters, guys). The plot is gripping, fast-paced, and full of tension (really full) and the last few chapters are particularly emotional. I just finished reading it myself and I have to admit that I spent the last fifty pages or so trying not to cry and failing most of the time. (I get super involved with these characters. It’s embarrassing.) No spoilers, though. You’ll just have to read it for yourself. I will say, though, that the first time I read this, I had just finished Glimpses of Truth and had been very shaken by a character’s death in there, so when I got to the place in Beyond the Sacred Page where it looked like another character would suffer the same fate, I skipped ahead to see if they did, in fact, die. (Something I pretty much never do.) Thankfully they didn’t, which was a huge relief. I know, right? 🙂 He’s also done modern fiction, Christian supernatural fiction, one book set in Bible times, and two set in 19th century (I believe) Africa. Super awesome.